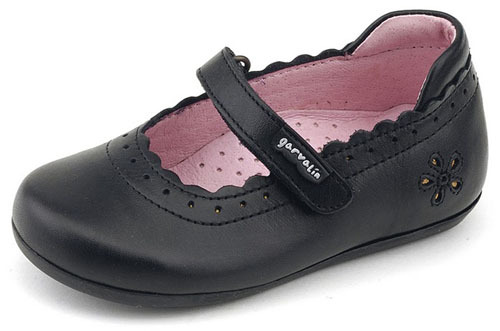 These high quality black leather classic mary jane's will look perfect on your little fashionista. •	Leather upper with fun floral cut-out detail and scalloped trim. •	Hook-and-loop closure for an adjustable and secure fit. •	Cushioned leather footbed for all-day comfort. These shoes are so comfy and good quality with very good arch support. My daughter wears them to school every day and she loves them. They look very classy. I'm very happy with my purchase. Very well made shoes and super comfy!